Creating a welcoming landscape is an ongoing goal for many New Jersey homeowners. Adding an outdoor walkway to your property is a great way to improve the curb appeal while adding a touch of welcoming elegance. Before choosing the style of the walkway, it is important that homeowners consider how it will be used most. Will the walkway undergo constant foot traffic or is its sole purpose to be a focal point for your property? Knowing how the walkway will be used will help you choose the right materials and style during the planning phase of the project. Since the design options are endless, understanding how each option performs or is impacted by weather will assure the walkway is durable as well as eye-catching. Brick walkways are known for their traditional red appearance, but there are other several color options homeowners can choose from including brown, dark red, and tan. One of the benefits of using brick is that it is easy to maintain and clean up. Plus bricks are an eco-friendly option since often times bricks are salvaged, cleaned and re-used. A downfall to choosing brick is excessive traffic such as vehicle traffic or ice in the winter can cause them to break more easily. 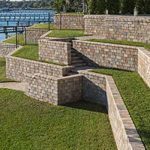 While natural stone may be more costly than other options, it is still one of the most popular materials used to create outdoor walkways. Every piece has its own unique cut and appearance. Natural stone is a highly durable and great option for areas, such as New Jersey, that experience periods of freeze and thaw throughout the winter months. Whether homeowners choose rectangular pattern flagstone or irregular flagstone, the look creates an elegant end result. Many homeowners opt for flagstone because of its natural appearance and non-slip texture. Concrete pavers are another favorite choice for outdoor walkways due to their durability, strength, and beauty. 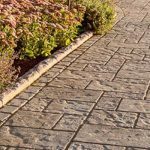 For many homeowners, concrete pavers provide more options to match the walkway to other outside elements because of the many colors and accent options/combinations. Before deciding on a material to use, request samples that you can sit outside at your house. Throughout the day or week, take note of how they change colors in various lighting or how they respond to different types of weather. Does the color look less appealing when the light is different compared to how it looked in the display area? Morris Brick & Stone has a local outdoor display area at 108 Ridgedale Ave. (behind Mazda Cars) in Morristown, NJ where you can see available options in person. Contact us today for additional information.